Casa de la Armonia is a very spacious 2,368 square feet penthouse with plenty of space for reading and relaxing. The complex has only 27 units which creates a very homey atmosphere, and quickly becomes a home away from home. The condo is only a few minutes walk to the Santa Cruz beach where numerous restaurants allow you to spend a leisurely day on the beach under the umbrellas or palapas, eating ceviche or guacamole or fresh fish, or having a beverage - on breaks from playing in the ocean, swimming or snorkeling or looking for shells! Occasionally you can have a front row seat and watch the cruise ships pull in. The condo has 3 Bedrooms and 3 bathrooms (Two 3-piece bathrooms and Master bathroom with Jacuzzi bath/shower) and is perfect for families wanting to holiday together while still having plenty of opportunity to have their privacy and space. Bedding is 1 King (master), 1 Queen, and 1 double plus a double/twin bunk bed (perfect for kids, or couples). The master bedroom has a private terrace (perfect for that quiet morning cup of coffee!) and a second terrace is off the spacious living room and dining room area. There is a separate TV room for teens to game or anyone to watch movies (stocked with a bit of an assortment). Over the years we have found this perfect for allowing kids to mellow out at nap time, wind down at the end of the day, or allow us some quiet time once everyone else has gone to bed. The dining room and kitchen are large and very open, and there is a separate wet bar. There is a service room with washer and drier, but don't worry about the major cleaning as our housekeeper is available at least 2x per week to assist you. We highly recommend that you have us arrange transfers to and from the airport in advance. The cost will calculate on booking and can be deleted if not required. Optional meals (Ana is a fabulous cook! ), as well as excursions, can also be arranged with Ana once you arrive. NOTE: THE CONDO IS CURRENTLY LISTED FOR SALE as we have been unable to visit as frequently as we would like due to some changes in our family medical situation. I know it is not an active market right now. If anyone is interested in buying we have made the realtor aware that it is still a rental property and existing bookings would have to be taken into consideration. 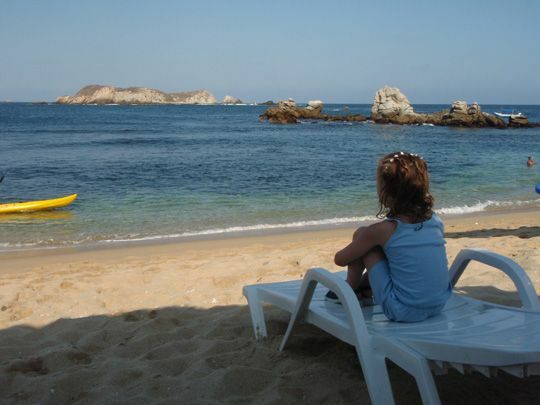 We discovered the gem that is Huatulco mainly through friends who Teras met through the Marlin Travel network ... who knew of this 'secret wondrous place' at the time ... and had chosen Huatulco as their retirement home. We fell in love with the small town, safe feel of the area, the sense of community, the food and culture, and especially the cleanliness and environmental consciousness of this tourist destination. Town of Crucecita easy 5 minute taxi ride - excellent restaurants and shopping. Can get out to tour Coffee Plantations. Surrounded byHuatulco National Park. Two small towns in walking distance - Santa Cruz and Crucecita. Comfortable small town feel. Pay as you go phone for you to use while in Huatulco. Programmed with basic contact numbers such as Ana (housekeeper), taxi, STS tours, doctor. Units in the dining Room & bedrooms. We recommend limiting use for both expense and health. We run a/c for ~20 min before bed and run area fans at night when hot. Extra charge for high use. Please hang wet towels, bathing suits, etc. in the laundry room or on the drier rack and not over the decks. Condo bylaws. 1 space is included. Taxi service is excellent, frequent, inexpensive ... and money into the local economy! $1 shows on quote and can be removed if not required. We have unlimited WIFI now! ... but keep in mind it is not the same high speed fibre optic you may take forgranted at home. There may be delays, or service interruptions. Separate beach towels are also in the bathroom cupboard. Side by side fridge and freezer. One large water bottle included per week. Water truck comes to the complex weekly. Convenience store 1/2 block away and taxi to local grocery stores is easy. Huge kitchen with gas stove, plenty of counter space, coffee maker, toaster oven, microwave. Pots and pans, dishes, cutlery, etc. Some water shoes, flippers, snorkels and masks in the condo. If you don't have your own we can ask Ana to check sizes that are there to see if we have what you need. No handrails, and tile stairs can be slippery when wet. Great maintenance and housekeeping, but please use caution. Rules posted by pool, bathroom on main level. Again, please respect this is a winter retirement home for many of the (mainly Canadian & American) unit owners and not an all inclusive party hotel. This 3bedroon/3 bathroom condo is beautiful with lots of space to relax, a wet bar, elevated seating area, two balconies and a dedicated TV room. The beds were very comfortable and the condo was clean and came with everything you would need. The owner went above and beyond by having basic groceries delivered/supplied, an airport shuttle and Anna's famous guacamole to greet you after a long travel day. Our kids (5 and 9) loved the pool and the calm waters of playa santa cruz a short walk away. The other renters/owners were friendly and welcoming. I would not hesitate to recommend this property. Keep in mind it is a 4th floor unit and there is no elevator. The stairs didn't bother us but it probably wouldn't be ideal for a renter with limited mobility. It's a great place to call home while you explore huatulco with it's friendly people, hot weather and beautiful beaches and bays. ;) makes me wish I was there right now! A well maintained property in a good location. Owners of the condo were accessible, easy to deal with and very helpful. Close to many good restaurants and walking distance to beach. Very nice vacation spot. Well worth it if travelling in a group. Very comfortable. Only negative would be the AC can have issues, but they are working on it. The condo is beautiful, comfortable and a great place to start the days adventures! Taxi's are plentiful and inexpensive. Ana is an excellent ambassador for Mexico and can arrange for any kind of excursion you may be interested in. Had a fantastic time! I am sorry this guest was not satisfied ... more so that I was not able to remedy any concerns as I was not made aware of them until after their departure. The condo was cleaned prior to the guests arrival, concerns were not brought to my attention upon arrival, nor during the stay, and a request for a refund to compensate for the lack of cleaning mid-week was processed. From speaking with our housekeeper about this concern, there seems to have been a miscommunication between the guest and our housekeeper regarding calling to schedule cleaning. Batteries have been replaced in one a/c remote and we are investigating how to get a new remote for another unit. I will be at the condo prior to next season and plan to have the additional a/c remote situation resolved before I leave again. Please see other reviews to put this review in perspective, as I have. Feel free to contact me directly if you have any further questions. There are numerous beaches for you to explore ... all easily reached with the assistance of a local taxi driver or even public transport if you wish. Check out La Bocana, Entrega or Maguey or Chahue, the resort area around Tangolunda, or venture further away to San Augustin or Puerto Angel or Puerto Escondido to watch the surfers. Tours can be arranged in advance or with the assistance of Ana, our housekeeper. We have used STS tours for years and can recommend their guides and tours. Whether you are interested in an eco tour up into the Sierra Madres or a couple of days to Oaxaca City to see the pyramids and the historic old city, or 4 wheeling through the jungle, checking out the turtle and crocodile sanctuary, or checking out the local nightlife, they have something for you. We have had very few service interruptions over the years but it is possible for water or power to be limited or off on rare occasions. We have never experienced any earth movement although it does occur in the Huatulco area and friends have experienced them. Our housekeeper and condo management are available to assist if necessary.